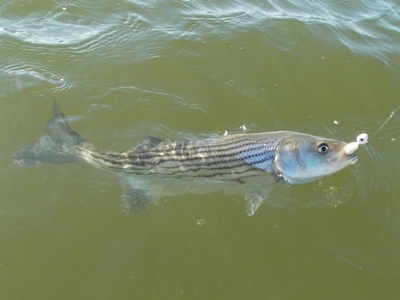 The Chesapeake Bay is a major nursery for Atlantic striped bass. The striped bass, also known as “rockfish” is one of several anadromous fish that pass through the Chesapeake Bay Watershed. In early spring, adults move up the bay into spawning areas. After spawning, most adults exit the bay and return to coastal areas of the Atlantic Coast. A few post-spawn adults remain in the Chesapeake Bay and its tributaries during the summer season. After hatching, young fish feed and grow in shallow estuaries until they are large enough to leave the bay. As adults, they live along the coast from New England to the Carolinas. During the late fall, schools of adult striped bass return to the Chesapeake Bay to feed on baitfish. As water temperatures continue to decrease, the migrating striped bass once again exit the bay in search of warmer water.